I'm not really sure what this has to do with eggs - when I went looking for an appropriate picture to use here I stumbled onto this and it made me laugh. Every few weeks I play poker with a bunch of semi-degenerates. We have a rule that each player needs to bring a snack to share. Most of the time it's what you would expect from a group of guys - chips and salsa, a box of tacos from the local Mexican restaurant, sushi from the local supermarket, and chicken wings. Cynthia asked me if I had decided what I was going to bring that night and when I told her I planned to pick something up, she said she would take care of it.Little did I know that when I got home from work, I would find this waiting. 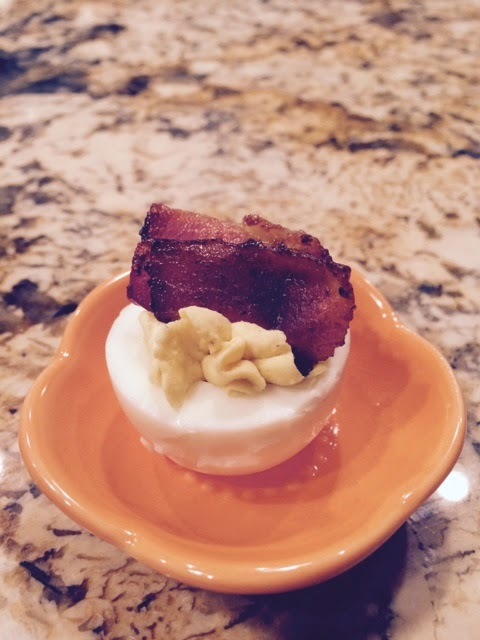 That, my friends is not only a deviled egg, it is a deviled egg with a piece of Nueske's bacon that has been candied on top! If you don't know about Nueske's applewood smoked bacon, check out the link. WARNING: if you get up the courage to spend the money to have your bacon shipped from Wisconsin like we do, you'll never buy that brand we all grew up with again - but I digress. So, there I was, confronted with something that actually looked a lot like an egg. Remember, in the previous episode of this journey into Eggdom, I tackled a cheese souffle which, in all honesty, didn't look at all like an egg, but this thing, nope, no mistaking it - EGG. But there was BACON too - I love bacon (OK, who doesn't?). I decided to suspend my primal urge to run away. So, without further ado, here is are my impressions of the first deviled egg I've ever eaten. Texture - a little odd, not unlike jello that was "older", but pleasantly offset by the creaminess of the yolk and the crunch of the bacon. Fragrance - well, you all probably know, but I worked in the chemical industry for a good part of my career and have a high tolerance for odors. Conclusion - I'll eat them again. In fact, I did that night at the poker game.
" ...to Al's wife for the Deviled Eggs with Bacon, I think we can market those and make millions...they were super and I only had 2 because they were gone around 7:38. #AWESOMELYDELICIOUS"
For the record. I got there at 7:30. P.S. 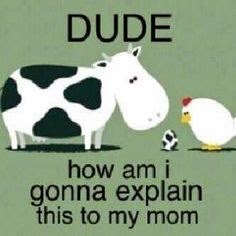 for those of you that may be jumping into this ongoing egg saga, you may want to read this post which will help put some of these seemingly odd ramblings in perspective.